Chèvre in French simply means goat, and that’s where our story begins. Farmers who used fresh goat’s milk to make cheese have referred to it as chèvre for centuries, and the use of the word spread with the cheese’s popularity. The craft of making authentic, artisanal French chèvre has been passed down between generations of farmers for thousands of years. “The Original Chèvre” is the first U.S. campaign for French goat cheeses. France is the country of origin for goat cheese ‘par excellence,’ the product of an expertise developed over centuries of artisan craftsmanship. First comes the milk, which is directly linked to the land, or terroir, where the goats roam. Historically, French chèvre has been produced in eight regions (Poitou-Charentes, Centre-Val de Loire, Bourgogne, Rhône-Alpes, Provence-Alpes-Côte d’Azur, Languedoc-Roussillon, Midi-Pyrénées, Aquitaine) south of the Loire River, where the geography, geology, and climate dictate the varieties of cheese made there. 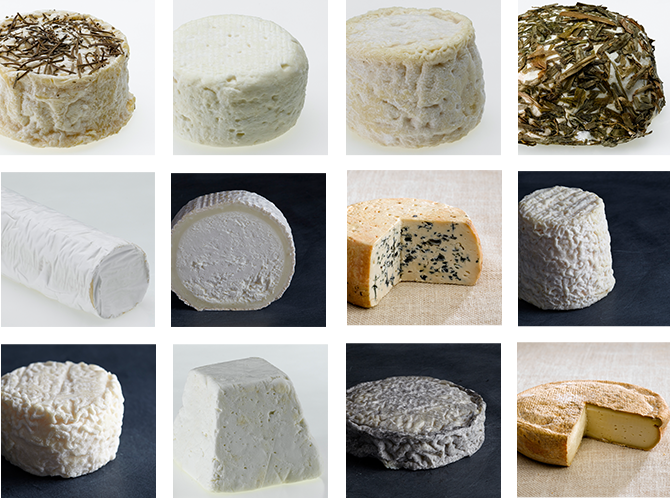 The Original Chèvre is about variety. 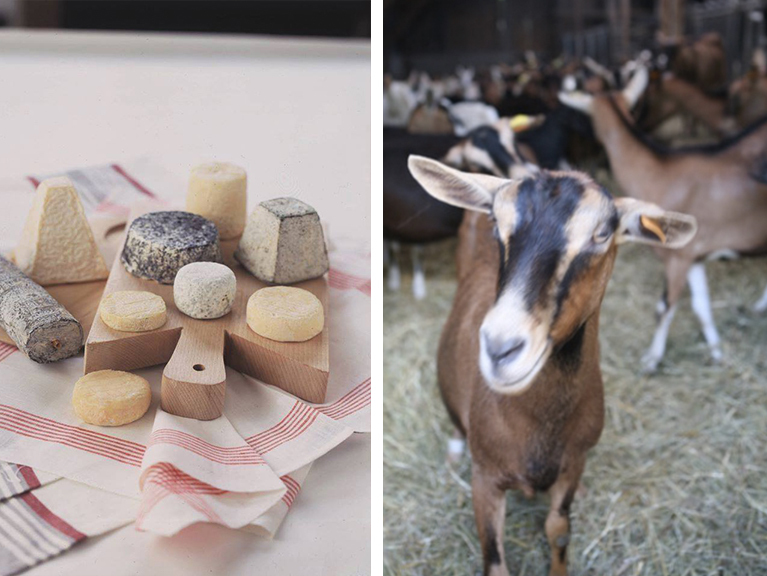 There are over 3,000 goat cheese producers and about 60 dairy companies in France. France is the #1 producer of pure goat cheeses (i.e. made of goat’s milk only) in the world, and produced about 120,000 tons (265 million pounds) in 2016. 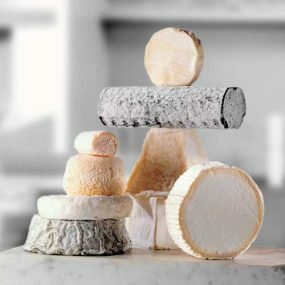 Fourteen goat cheeses (out of 45 cheeses total in France) have been given the PDO (Product Designation of Origin) label, ensuring that the chèvre has been made in a strictly designated geographical area, using only local milk and traditional production techniques. Goat’s milk can be used either raw or pasteurized (heated to 165°F for 30 seconds). The milk is then brought to 64–65°F and lactic fermenting agents, or starter cultures, are added. Rennet is added to allow the gradual coagulation of the milk over one to two days. The solid curd is usually drained through a cloth, and is made up of caseins (large molecules of milk proteins) and fat. The curd is then ladled into small, perforated molds, called faisselles. The shape of the cheese is determined at this stage. This stage takes place in a clean, dry location, lasting around 24 hours, entails removing the remaining whey from the curd. Salt is usually sprinkled over the cheeses once they are in molds; however, salt can also be mixed into the curd. This stage is essential for bringing out the taste. The salt also curbs the proliferation of micro-organisms. While some cheeses are eaten fresh, after being drained, others need to be aged. Cheeses are taken out of their molds and placed on racks in a room where the temperature is maintained at 50–51°F. This room, called a hâloir, must be well ventilated with 80% humidity. 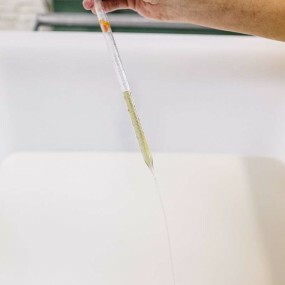 The fresh curd slowly becomes a cheese which, depending on which maturing bacteria were used, can develop a fine white, yellow, or brown mold on its rind. After molding, some cheeses can also be dusted with a fine charcoal powder, usually from oak. This is why some cheeses are ash-covered. Here, cheeses are turned regularly by hand. The cheese-maker monitors the maturation process by touch, sight, smell and taste. The texture of the goat cheese varies depending on the amount of rennet used to create the curd. 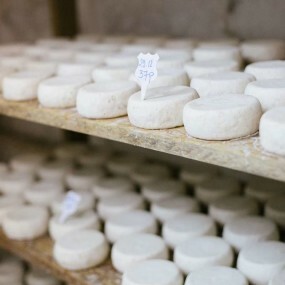 The lactic production method applies to 80%–85% of French goat cheeses. The milk coagulates slowly through the use of a small amount of rennet and lactic fermentation agents, or starter cultures. The mixed curd production is used for 10%–15% of the cheeses, mainly Camembert-shaped goat cheese. It uses three times more rennet, causing the curd to form more quickly. 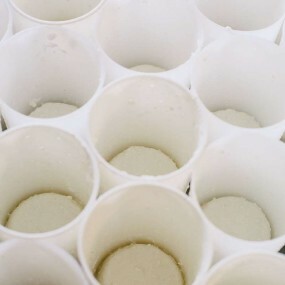 To make pressed cheeses, such as tommes de chèvre, about six times more rennet is used than in the lactic production method. Supple and moist chèvre, just out of the mold, already has a delicate taste. The cheese is still very white, but is now more homogenous. The fresh sensation and milky taste give way to a more subtle goat cheese flavor. A fine white, yellow, brown or bluish rind (depending on maturation bacteria) begins to develop on the surface of the cheese, which is now part-dry. The now dry cheese has a firm, compacted texture that crumbles slightly under the blade of a knife. Its taste is more developed and complex. A well-drained, well-matured goat cheese can last many weeks (or months) in a hâloir or room kept at a low temperature and humidity.